Evolved to Eat Meat? Maybe Not. Eating meat has been linked to cancer, high blood pressure, heart disease, diabetes, stroke, dementia, and so many other diseases. Shivam Joshi, MD, Physician. Blogger. Plant-based diet enthusiast. Fruitful discussions welcome! Eating meat has been linked to cancer, high blood pressure, heart disease, diabetes, stroke, dementia, and so many other diseases. Nearly every modern lifestyle disease has been associated with meat. With so much emerging evidence against meat, it begs the question were we really evolved to eat it in the first place? During evolution, humans and their ancestors did eat meat, and some have used the historical precedent as evidence for eating meat now. The idea has been popularized in many fad diets, including, most notably, the “Paleo diet.” According to such diets, our Paleolithic ancestors were unencumbered from unnatural influences, like the late-night lure of fast-food restaurants or the beckoning call of a vending machine. In prehistoric times, we only ate only what nature provided, like meat. Since we ate meat then, we should eat meat now–so the theory goes. But maybe not. There are big problems with this theory: namely, there was no one specific “Paleolithic diet.” As our predecessors left Africa, they likely encountered different climates and terrains, each offering different resources for hominins (the term for humans and their immediate ancestors) during evolution. Anthropologists believe there were many Paleolithic diets, and meat may have been a part of some of those diets. Some may have consumed meat, while other consumed fruits, tubers–think potato family–or other foods. Early hominins ate whatever was available to survive. Eating to survive is different from dining for long-term health. The difference comes into full view when we risk long-term health for the benefit of short-term health. For example, if you were trapped in a candy store with no way out, you would eat candy until you could escape–even if it took days, weeks, or months. If your survival depended on it and assuming there was nothing else to eat, you would eat candy as long as it was available despite all the sugar in candy, which can increase your risk of diabetes. Anyone would sacrifice long-term health for survival in this type of scenario. Even if you didn’t know about the risk of diabetes, you would still eat what was in front of you, which in this case is candy. As weather patterns and biomes changed over millennia, our ancestors were forced into similar situations, especially as they migrated out of Africa. Food sources would have changed with their surroundings forcing early hominins to eat what was in front of them. In some situations, this would have been meat, in others it could have been grains, or tubers. Of course, our ancestors had no idea about any of the long-term health effects of the foods they were eating: They were operating under the basic human need of avoiding starvation, which could occur easily with a change in climate, the occurrence of a disease, or overexploiting a given location. Acquiring food in the Paleolithic era was not as easy as it is now. Had they found candy in the African savannah, they would have consumed that also. The versatility in eating so many different foods, and surviving in so many different climes, is likely what has led to the survival of our lineage. The lack of dependence on any one specific food is likely why there are no specific adaptations to any of these foods, including meat. Indeed, there are no adaptations to acquiring meat or consuming it. Humans descended from a long line–roughly 40 million years–of herbivorous ancestors that is shared with living primates, which is why we are so closely related to chimpanzees. When we compare our digestive tracts to those of chimpanzees, we find more similarities with them than with other species who have truly evolved to eat meat, like tigers. Human dental and intestinal morphology resembles those of the primates more so than they do of the big cats, which is one reason why eating raw meat is not well-tolerated in humans. Eating cooked meat isn’t well-tolerated in humans, either. The simple act of eating meat can cause you to die from choking. In fact, meat has been shown to be the leading cause of fatal asphyxiation for both adults and children in several populations. 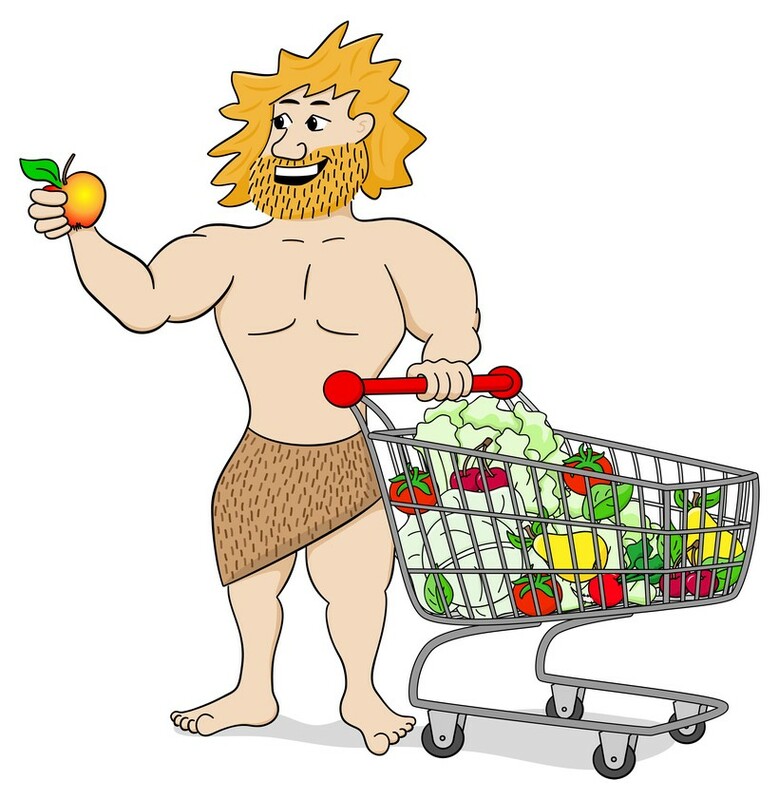 Assuming you don’t choke to death, many popular evolution-based diets not only argue that human carnivory is based in evolution–which have seen is not entirely accurate–but is also the salve for most lifestyle-related diseases, which happens to be another fallacy. Humans of today have the benefit of modern medicine to put this idea to the test. If an organism does something that is out of character, we might expect to find perilous consequences from that behavior. A good example is to consider dogs eating chocolate: Dogs don’t eat chocolate in the wild, but chocolate is a staple in the homes of many humans and, when consumed, is fatal for our beloved canines. Going back to the example of early hominins in the savannah eating candy, we would expect to find diabetes and caries in our ancestors over time. If we then look at meat longitudinally, we find it increasing the risk of diabetes in humans too. Eating as little as 50 grams of meat, about half the size of a deck of cards, has been shown to increase the risk of developing diabetes. Similar results are seen with other diseases that are so common in the Western World. If we look at the totality of human evolution, we find that our lineage has not only survived, but thrived on a plant-based fare. Indeed, plant-based diets do reduce our risk of diabetes and reduce our risk of other diseases, like cancer, dementia, high blood pressure, heart disease, and obesity–producing results that are the opposite of what is seen with meat. With so much evidence pointing us the other way, a more accurate description of an evolution-based diet might include less meat and more plants. Shivam Joshi is a physician with an interest in plant-based nutrition who blogs at afternoonrounds.com. You can follow him on Twitter: @sjoshimd. Originally published at www.huffingtonpost.com on March 5, 2017.